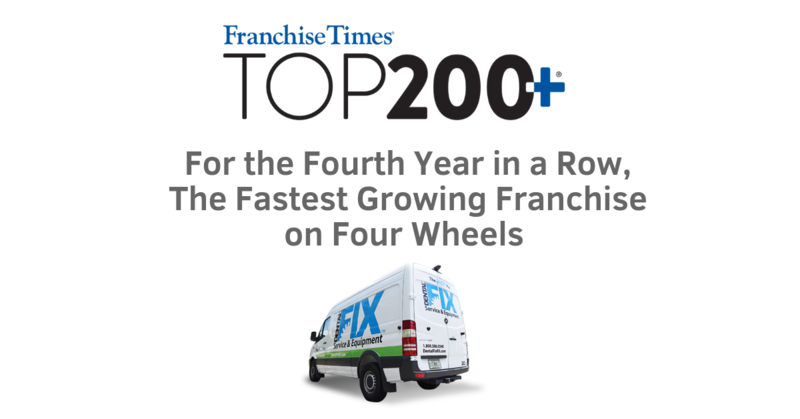 DAVIE, Fla. (Oct. 4, 2018) – Dental Fix Rx, a fast-growing mobile dental equipment repair service franchise and a subsidiary of Dental Whale, has earned a spot for a fourth consecutive year on Franchise Times magazine’s 2018 Top 200+ list of top revenue producing U.S.-based franchises. Noted as the most respected ranking in franchising, the Top 200+ measures the largest 500 U.S.-based franchise companies by year-end global sales across all company and franchised units. Servicing 1,000 new customers every quarter, Dental Fix Rx ended 2017 with more than $35 million in system-wide revenue. The company has awarded more than 200 franchise territories that service over 53,000 customers throughout North America. Dental Fix Rx earned the No. 490 spot for 2018. Dental Fix Rx is the only U.S. franchise that truly serves the $38-billion dental equipment repair sector. Launched in 2009, the fast-growing franchise expects to award another 40 before year end. With fewer than 400 franchise territories available throughout North America, Dental Fix anticipates all U.S. territories to be sold within the next two years. Dental Fix Rx was also recently recognized as one of the fastest growing franchises in the U.S. in 2018 on the Inc. 5000 List for a fourth year in a row.